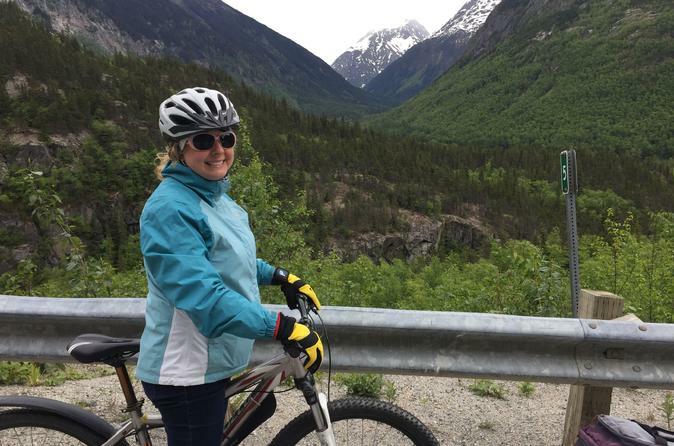 Ride the White Pass and Yukon Route railway from Skagway to Fraser, then join a guided, 15-mile bike ride for the scenic return trip from the mountains to the coast. Experience a remarkable landscape of rugged peaks, glaciers, and waterfalls, on a train built for the Klondike gold rush, now a Historic Civil Engineering Landmark. This 4.5-hour train and bike tour departs from downtown Skagway, and is limited to 12 people for individual service from the guides. Start by boarding the White Pass and Yukon Route railway at Skagway station—trains depart at 7:40am and 12:10pm, and it’s recommended that you arrive at least five minutes prior to departure time. The 1.5-hour, one-way trip to Fraser passes through gorgeous scenery, the same places that gold prospectors once passed through as they headed into the mountains of the Yukon. Upon arrival at Fraser station, meet bicycle guides who will go over the route back to the Alaska coast. 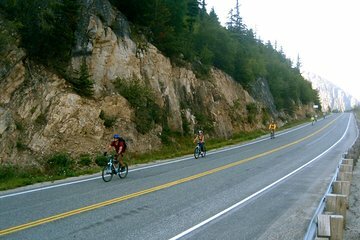 First, take a short van ride on the Klondike Highway to the summit of White Pass, then hop on your bike for the 15-mile, downhill ride. It’s worth bringing extra layers of clothing for this portion of the tour, as temperatures can be chilly in the mountains. Enjoy views back towards the railway as you ride, with plenty of time to snap photos of the waterfalls, glaciers, mountains, and historic sites along the way, and even crossing over the United States border (don't forget your passport). This 4.5-hour train and bike tour concludes at a centrally-located bike shop in downtown Skagway. This trip is excitment all the way. The train trip must be high on any adventure with stunning scenery, the guys from Sockeye Cycle met us at the summit and set us up for the 15 mile downhill bike ride in these spectacular suroundings. We made several stops for photos with our wonderful guides on our ride to the sea. A Big adventure. We had a great excursions on 6/23/17!! We had 8 people in our group 4 adults and 4 teenagers. The team at Sockeye Cycle Company did a wonderful job the entire time. The train ride up was very nice, relaxing, and had some great views lots of picture opportunities. It was quite a bit colder up at the top of the mountain, so be prepared with layers. Our guides Josh and Madi were amazing! My daughter was a bit nervous going down the steeper roads, so she was able to ride in the van and skip the steep roads. Overall, we had a great time and highly recommend this tour. My husband and I did the White Pass Train and Bicycle Tour on May 22, 2017 and we had an amazing time!!! The train trip up the pass was awesome and the changing landscape beautiful. The narration was very helpful and the attention ahead of time for upcoming sights perfectly timed. The bicycle down from the summit was great! It was very chilly at the top, so layering is a MUST. They provide lots of warm clothing also. Safety is their 1 priority and we felt completely at ease along the journey. We would definitely recommend this tour to our friends and if we are ever in Skagway again, we will do it again. This was a fantastic trip! The train ride up is scenic and bike down was fun. We had great weather as it was sunny and warm. Our guides Sophie and Erin were helpful and knowledgeable. The downhill was fast and fun. This is a must do trip. Sockeye bicycle had very nice bikes and the train is a classic. It was pouring rain, but our tour guide and tour was awesome! When we made it back to the bike shop and all said that was the best excursion! Love this trip and would recommend it. Our guides were great. It was a bit cool. We had beautiful weather. Did the 12:30 tour. The only thing is you are going fast and can't really take int he scenes BUT you do stop along the way. This tour was the highlight of my cruise. The train up to Fraser was stunning. You really get to see the engineering marvel and spectacular sights of Skagway. After arriving at the Fraser station and cleared Canadian customs, the guides take you away for the bike tour downhill to town. Our guides, Ryan and Annie was really fun. They really seemed to enjoyed their job as guides. And through the ride we stopped periodically for photo and to regroup. I only wished I knew how cold it was going to be going downhill with the wind in your face really reminds you that this is Alaska.